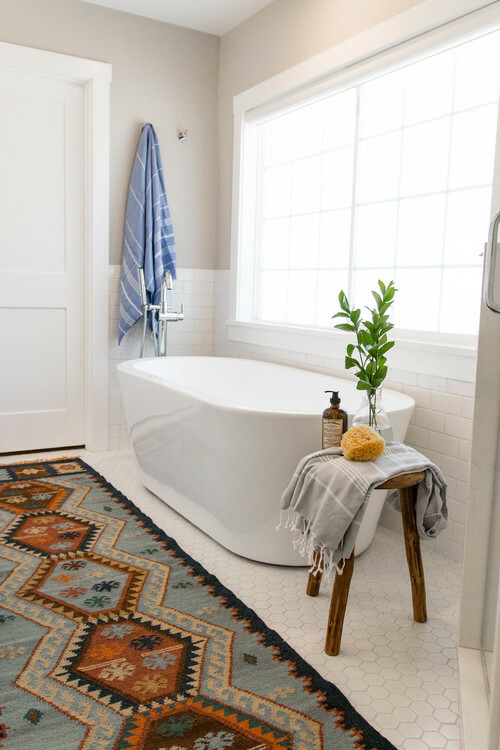 Farmhouse style has made a name for itself in the bathroom. 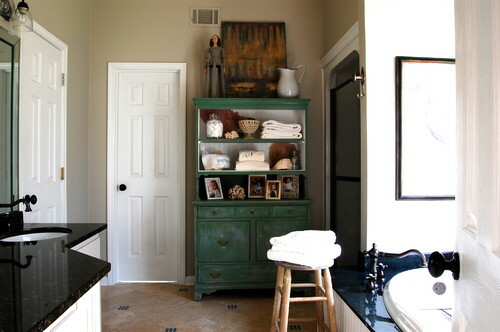 You have the claw-foot tub, the earthy color palette, and the handy shelves and stools dotted around the room. Together, these farmhouse-style features create a soothing, collected-over-time feel that can make almost anyone want to sink down into a warm bath and relax. Let’s take a look at six bathrooms that highlight different elements of farmhouse style. Add one feature to refresh your bathroom, or soak all of them up to create a full-on farmhouse bathroom in your home. 1. Say yes to open storage. Simple wooden shelves hold bathroom essentials and a blooming orchid in this home in Savannah, Georgia. The exposed brackets — painted white like most other elements in the room — and the cafe curtains add another touch of country charm. Along the side of the shower, interior designers Victoria Holmes and Lana Salter created a ledge that gives the homeowners even more open storage. The slim ledge is big enough to hold a wooden body brush and a few potted plants. The farmhouse style continues in this space with white-paneled walls, subway tiles and the star of the show: a claw-foot tub. 2. Stash the towels on hooks and stools. Farmhouse style is all about keeping it simple. On that note, Rebecca Zajac of Design by Numbers gave a Las Vegas couple two big hooks on the wall for their towels. The hooks are simple but meet the couple’s needs. Next she added a rustic wooden stool. It brings in a natural texture and functions as a side table to the tub. Drop your gaze to the floor under the stool legs, and you’ll find 2-inch hexagonal tiles, a feature that gives a nod to the client’s love for vintage style, Zajac says. 3. Give something old a new life. Farmhouse charm oozes from this antique family storage unit that a Georgia couple repurposed as bathroom storage. The coat of seaweed-green paint updates its aged finish and makes it stand out against the tan and white colors surrounding it. The cabinet also keeps with farmhouse style by having open shelves on the upper part. Here the couple displays family photos right alongside fresh towels. 4. Perk up the walls. An earthy palette — full of whites, tans and greens — inside this California home echoes the colors outside the window. Beyond color, architectural designer George Bevan of Bevan + Associatesadded horizontal paneling to counter the high ceiling in the small space. Spikes of green also protrude from the wall. Those are air plants arranged over the tub, giving the room a bit of nature inside. 5. Go with a classic. 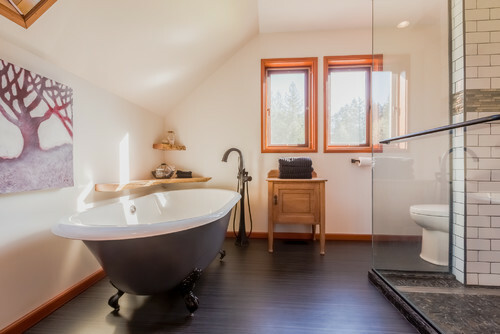 A cast-iron claw-foot tub steals the show in this Canadian home. The homeowners decided to splurge on it, along with the stand-up faucet, says interior designer Bethany Van Hecke. The classics continue in the shower. 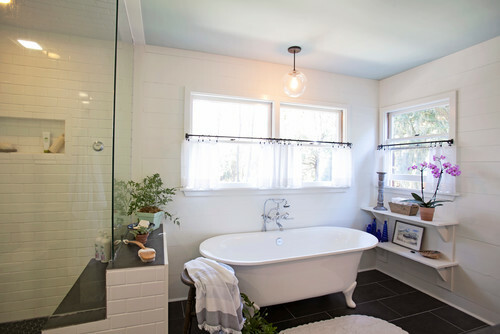 Beyond the glass walls, floor-to-ceiling subway tiles complete the rest of that washing space. 6. Open up to the idea of a barn door. 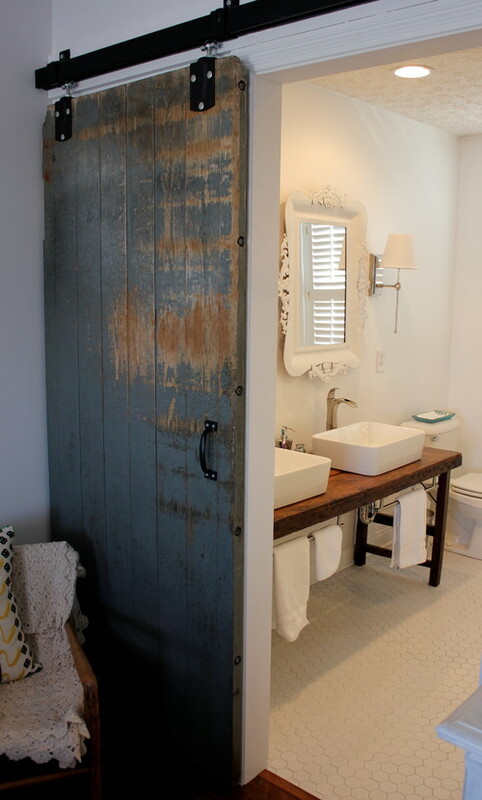 Nothing says farmhouse like having a barn door lead to the bathroom. These handy homeowners wanted to save on this feature and decided to do it themselves. They found the door at a salvage yard; it had come from an old dairy farm in Ohio. Then they found the materials for the door’s track at a local tractor supply company, and $128 later, they had a working barn door for their farmhouse bathroom.